Full disclosure: I am not wild about theme parks. That said, I adore LEGOLAND Florida. If your kids are under twelve and are LEGO-fanatics, they’ll also fall in love with a park that’s dedicated to their age group and their obsession: the LEGO brick that has inspired creativity galore in family rooms and bedrooms all over the planet. My kids’ hands-down favorites include LEGO Ninjago – The Ride! 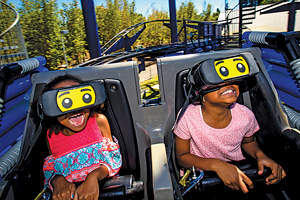 (a little like King’s Dominion’s Boo Blasters), Flying School, The Great LEGO Race (the new virtual-reality coaster), The Dragon, Driving School, and Beetle Bounce. My favorites? The water-ski show, the aforementioned movies, and taking photos of my kids every single chance I got! 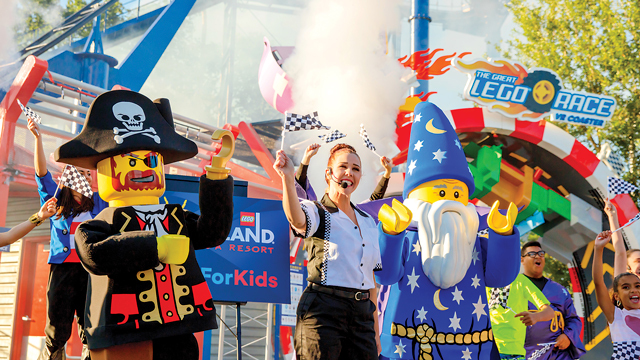 But truly, I’m mom-style wild about this theme park because of what I like to call “art in the park.” LEGOLAND calls it Miniland USA – and it’s made up entirely of LEGO bricks intricately fashioned into scenes from our world. You’ll see the NASA space shuttle blasting off in Florida, the Eiffel Tower, monuments in Washington, D.C., and New York City’s skyline. As a former Californian, I was tickled to come upon an entire area devoted to San Francisco, featuring the Golden Gate Bridge and the Painted Ladies (those iconic Victorian homes, to save you time Googling). Kids will be astounded to see life-sized LEGO Darth Vadar and R2-D2. From Star Wars, they’ll also see the Millennium Falcon taking off from Tatooine, and the invasion of Naboo, plus the newest scene to join LEGOLAND, The Force Awakens exhibit, featuring dramatic scenes from the Episode VII movie, enhanced with lights, sound effects, and animation. In the language of LEGO, this translates to super-duper-cool Star Wars LEGO sights your kids will go bonkers over. Just like the rest of LEGOLAND Florida! 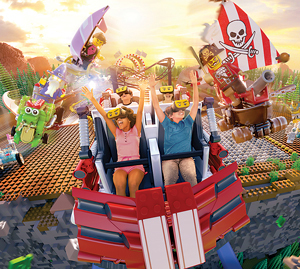 For the best LEGOLAND Florida experience, try to visit for two full days. You can easily spend an entire day on LEGOLAND’s dry rides and a second day at the raucous water park. Obviously, plan to play at the water park when the temps soar. Prepping for an effective day in any theme park means planning. Theme park warriors create a successful strategy long before they actually arrive. So, explore LEGOLAND’s website and use the following information to get the most bang for your buck. LEGOLAND opens at ten in the morning each day. I know you’re on vacation, but this isn’t the time to sleep in. Why? Because mornings are the sweet spot at LEGOLAND. The wall of people seems to appear around noon or one o’clock. So arrive at nine-fifteen sharp to give yourself ample time to park, stand in line, get your photo taken in front of the LEGOLAND sign (no charge to pose), use the restroom, and so on. LEGOLAND is made up of fourteen zones (Imagination, Wheels, Building, Creation, etc.) each with many rides and play areas, and most with eating spots. When you first arrive, pick up a LEGOLAND map and the day’s show schedule. Travel Mom $uggestion: LEGOLAND allows snack-filled backpacks and a small cooler with drinks to be brought in to the park. Next, if the Great LEGO Race still has a short queue, take a second ride. If the line is already crazy-long, then head quickly to the Flying School and Driving School rides in LEGO City toward the back of the park. Why? Because the other guests will be sauntering through the front sections of the park. If your family heads to the back of the park and works its way forward, you’ll encounter fewer people and quieter lines – at least in the morning. Our favorite show is the Pirate’s Cove Live Water Ski Show that features water skis, jet skis, boats – and water skiers jumping off ramps and climbing onto people-pyramids. Don’t miss this fun show that happens at several designated times throughout the day. (Check the show guide you picked up at the gate.) Save LEGOLAND’s three 4D movies in the 700-seat Fun Town Theater for the afternoons. Your kids will love the surprisingly good 12-minute movies and you’ll savor all that delicious air-conditioning. 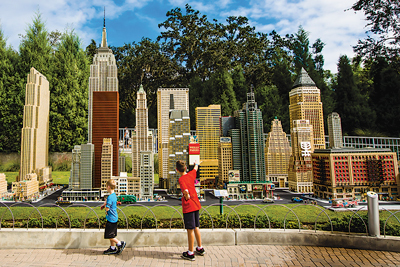 Is LEGOLAND for little ones? Yes indeed! Cutie pies under age two are set at LEGOLAND. Toddlers will love the character meet-and-greets (check show guide for location and times), the Grand Carousel in Fun Town, a live show in Heartlake City, and an entire area dedicated to their sweet selves in Duplo Valley. Travel Mom $uggestion: Bring your strollers to the park, or rent a single ($16) or double stroller ($22) each day. The best news? These little ones under two get free admission. 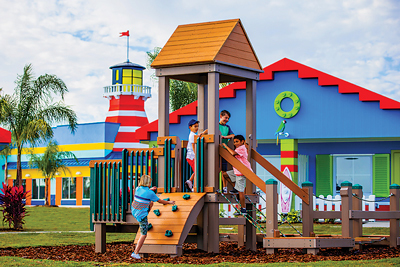 LEGOLAND’s colorful water park sits at the back of LEGO City behind the Flying School and is a destination unto itself. Like its land counterpart, the water park offers tons of no-scare fun with a modest thrill or two thrown in for older kids. The hours vary, but summer water park hours are usually from eleven or noon to four (always check hours on LEGOLAND.com). If you’re trying to visit both parks in one day, spend the morning on the dry rides, and the afternoon at the water park. If you opt for a 2-day pass, it’s smart to ride land rides one full day, and do the water park the next day. The place is huge! If LEGOLAND is a once-only trip for your family, it makes more sense to dedicate each day to land or water. When you arrive at the water park (you’re one of the first families in, right? ), you’ll find a Surf Shop loaded in oops-I-forgot items like sunscreen, bathing suits for kids and adults, and sunglasses. From your locker, you’ll see the Beach-n-Brick Grill that serves a super assortment of snacks and meals. My kids love the large pretzels, and picky-eaters will find PB&J sandwiches. To save money, we grabbed bottled water from our lockers. Conveniently located by the dining spots and changing rooms is the DUPLO Splash Safari for little guys (watery fun for six and under). But the best ride of all – in my book – is also a stone’s throw from the lockers. The Build-a-Raft River is a thousand-foot-long lazy river that lets kids (and parents) float alongside large bobbing LEGO bricks and build LEGO towers on these unique rafts using the bobbing bricks. Wreathing the lazy river are spraying fountains, lifeguards, and LEGO creations galore. Walk over a small bridge and you’re now in a huge part of the water park that’s home to an enormous wave pool, zillions of chaise lounges, LEGO-build stations for kids to create, restrooms, and an ice cream hut. But my kids’ favorite is a water play house called the Joker Soaker (like King’s Dominion’s Splash House) that has several levels of H20-fun, topped off with a 300-gallon tipping bucket. 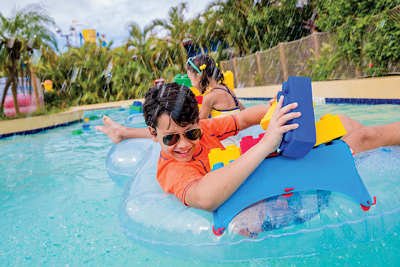 Travel Mom $uggestion: When you visit LEGOLAND’s water park, bring your own towels and swim suits, water bottle, snacks, bug spray, and sunscreen. I’ve known travelers who consider the journey to be part of the vacation. Still others want to get from point A to point B as cheaply – or quickly – as possible. 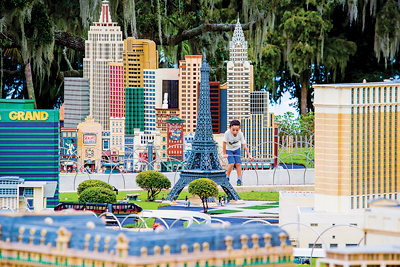 LEGOLAND Florida is technically in a small community called Winter Haven that shoulders Orlando, considered one of the least-walkable cities in America, which means you’ll need a rental car if you aren’t driving to Florida. Check out these ways to get from RVA to Orlando to decide what’s best for your family. Are you up for a truly amazing experience that your family will rave about forever? Consider riding the rails on an Amtrak roomette that hold two people each. Every roomette delivers two cozy beds and a potty/sink combo. The roomettes also provide impressive meals with menus, desserts, and cloth napkins. Two roomettes – that hold four people total – costs about $1,400 round-trip during a summer week. (Weekends are more like $1,600 for two roomettes.) For small families, Amtrak also has a bedroom that holds three people, but it books early and isn’t available on every train. To save money, consider my least favorite – but often used – way of travel: the arduous car ride from RVA to Winter Haven. If you skip bathroom stops, have the kind of car that lets you skip gas stops, and get lucky with no traffic challenges of any kind, you’ll make it to Winter Haven in a mere eleven hours. Or steal my strategy: Time those bathroom breaks. I gas up, give everyone a few seconds to use the facilities, and then chuck bags of chips into the black hole that is our backseat – and we make it to Winter Haven in twelve-ish hours. Are you trying to convince yourself that hotels don’t matter because they’re “just where we lay our heads at night?” Trust me, after a long day in a theme park, you’ll want a comfy spot to flop. Behold a solid list of properties near – and some right next door to – LEGOLAND. Keep in mind that some hotels include a resort fee, parking fee, and the Florida hotel tax (a combination of sales tax, plus a hotel tax which can equal 12 to 14 percent depending on the county). Triple-checking hotel costs and charges prior to your trip is your best bet for avoiding sticker shock. If you want a less-expensive LEGOLAND trip, here’s my blueprint. To begin, we sleep outside the tourism district. We don’t sleep near Disney World or Universal, nor do we stay close to LEGOLAND itself. Second, the property must provide a good free breakfast. But my most important must-have? Safety. I have stayed in funky hotels where I saved a bundle, but also listened to sirens screaming through the night. Never again. I highly recommend The Comfort Inn & Suites Maingate South that meets all three of the above criteria (4095 Hotel Drive, Davenport, Florida). Be careful to book the Comfort Inn in Davenport, Florida, and not Davenport, Iowa. (I’m serious!) Also, do not accidentally book the Quality Inn Maingate South like I did once. In my haste to find an inexpensive hotel, I booked this disaster of a property and came close to ruining our trip. The Comfort Inn & Suites offers a fridge and microwave in each room, a free breakfast, coin laundry, an outdoor pool, and free parking. The property is directly off I-4, and is a gentle 30-minute drive to LEGOLAND. For a casual dinner, check out Giovanni’s Pizza and the more upscale Ovation Bistro & Bar that’s next to Giovanni’s. Both are just a 4-minute drive from the Comfort Inn in Davenport, Florida (not Iowa!). If your heart ached for a trip to Maui (but the “kids are only young once” sentiment prevailed), the Omni Orlando Resort at ChampionsGate is calling your name. Unplug and unwind in this gorgeous resort that has two types of guest quarters. The first is a 16-floor hotel with stunning rooms and sweet views of the golf course and pool system. The second guest arrangements are 2- and 3-bedroom villas with the works: full kitchens, several bathrooms, laundry room, and flat screens everywhere. This 4-star stunner is just off I-4, about a mile from Disney World, and forty minutes from LEGOLAND. You’ll find both casual and fine dining spots at the Omni, a full spa, an impressive fitness room, a kids’ club, and coolest of all – a ginormous pool and lazy river system. I love that the Omni offers a free shuttle to Disney, but I’m no fan that parking costs $22 per night and the Omni resort fee comes screaming in at $30 per night. So calculate all those nickels and dimes when you do your trip-math. Travel Mom $uggestion: On days when you know you’ll be immersed in LEGOLAND fun from morning until exhaustion hits, consider a value-stay like the Comfort Inn. 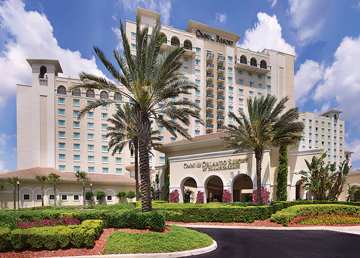 Then when you have more time to play at a beautiful resort, go ahead and relocate to the Omni. The Beach Retreat is across the street from LEGOLAND, which gives this value-resort an away-from-everything vibe. The Beach Retreat offers adorable cottages decked out in LEGO bricks that sleep up to five. Guests enjoy a buffet breakfast, along with a shuttle that whisks you to and from the park throughout the day. The breakfast spot transforms into a lively dinner location where parents can eat while the kids play at the lavish LEGO beach-themed play-station. Best of all, the Beach Retreat boasts a beautiful pool brimming in floating LEGO bricks and wreathed in colorful chaise lounges, fire pits, live music, and a bar – with fun drinks – for the parents. On the downside, the resort fee here is $20 per night, but that includes parking and all that shuttle use. Also, the pool is closed during the day, and there isn’t a coffeemaker in the room. Travel Mom $uggestion: Stock your room’s mini-fridge with food from the original, as in first-ever Publix supermarket that is a moment’s drive from the LEGOLAND Beach Retreat. This wildly fun “toy-tel” welcomes visitors via an enormous smoke-breathing LEGO dragon – created from 445,000 bricks – that roars from the roof’s hotel every fifteen minutes. 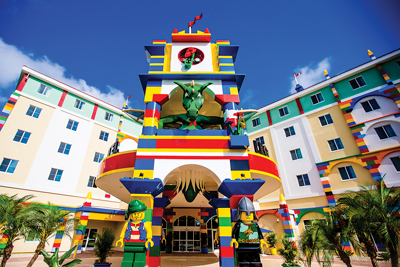 The hotel hits the LEGO lover’s jackpot with bricks and elaborate play spaces, and is just 150 steps from LEGOLAND (no, we did not count!). The lobby alone will mesmerize kids, so plan ample time to stop and build. Parents can oversee the kids and chill at the Skyline Lounge. Guest rooms come in standard and premium, and all rooms sleep up to five. Guest rooms come in four themes: pirate, adventure, kingdom, and friends. Standard rooms are outfitted nicely in LEGO, and the premium spaces are LEGO on steroids. Every room has a mini-fridge, coffee maker, and two flat-screen TVs. VIP suites sleep up to six people. No spoilers, but the elevators are a hoot! All guest rooms assure your family a lavish hot breakfast, access to the beautiful heated pool that overlooks Lake Eloise, and a session for each child with a LEGO Master Builder. I’m not wild about the hotel’s resort fee at $25 a night, plus 12 percent tax. However, parking is included in the price. Also, you’ll find massive storage space – just ask at the front counter! – to stash your suitcases if you want to spend your first or last day in the park (and haven’t yet checked in or out). My overall review? This one is 5-star wowza for the kids!